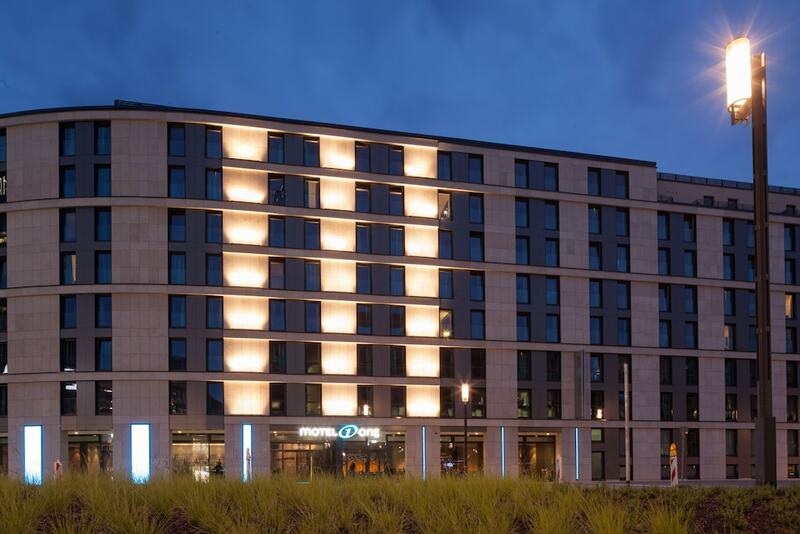 A stay at Motel One Frankfurt-Messe places you in the heart of Frankfurt, steps from Frankfurt Trade Fair and Skyline Plaza. This hotel is 0.1 mi (0.2 km) from Financial District and 0.4 mi (0.6 km) from Festhalle Frankfurt. Make yourself at home in one of the 401 air-conditioned rooms featuring flat-screen televisions. Complimentary wireless Internet access keeps you connected, and digital programming is available for your entertainment. Bathrooms have showers and hair dryers. Conveniences include desks and blackout drapes/curtains, and housekeeping is provided daily. This smoke-free hotel was built in 2013. Grab a bite from the snack bar/deli serving guests of Motel One Frankfurt-Messe. Wrap up your day with a drink at the bar/lounge. Buffet breakfasts are served on weekdays from 6:00 AM to 10:00 AM and on weekends from 7:00 AM to 11:00 AM for a fee.